They are amazingly fast. It took about a week for the boys to figure out how to catch them. Then it was a dozen in one morning once they found the plant that traps drinking water, and evasive geckos. They can hang from perfectly smooth glass, wet or dry, and support their body weight with one toe touching. But the toes are not sticky. They can also climb those surfaces at a meter per second. The nanostructured split-end hairs at the tip of the gecko’s toes exploit weak Van der Waals bonds at the molecular scale, conforming to any surface. 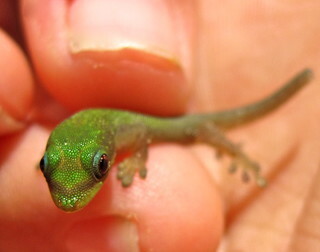 The gecko is a simply amazing animal, and it’s not just the nano-adhesive toes. High-speed video studies also shed light on the use of their tail for dynamic stability and flight, inspiring the robo-gecko experiments of Robert Full (see below).